Coming soon! All sessions are $10 for families with one child. $15 for families with two or more children. 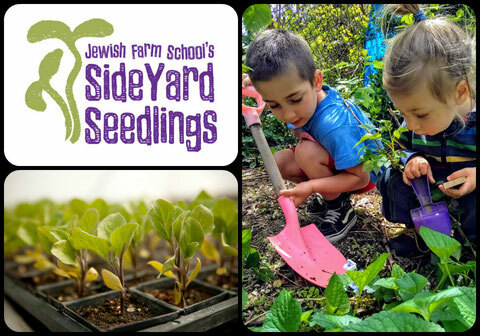 JFS Side Yard Seedlings is a new garden-based early childhood program launching in spring of 2018 and engaging children ages 2-6 and their caregivers through Jewish garden-based education. Children and their caregivers will gather at the Jewish Farm School garden at 50th and Cedar in West Philadelphia for a 90 minute experience which includes caring for plants, nature-based crafts, song sessions, stories, and age-appropriate games and activities connected to the cycles of the seasons and the themes of the Hebrew calendar. Tickets are $10 for families with one child and $15 for families with two or more children. Our doors are open to everyone, so if finances are a barrier for you, please email rowan@jewishfarmschool.org. Click here to learn more about what a typical session will be like and how to best prepare for a positive experience. Join our Side Yard Seedlings email list to stay informed about upcoming sessions and other family friendly events. Join our Side Yard Seedlings Facebook group to connect with other families. PJ Library and is run in partnership with jkidphilly.